At Skogar you will find the magnificent Skogafoss waterfall. In the area you find some of the most visited sites on the South Coast - such as Skógafoss and Seljalandsfoss. Skógar is the start or end point of the rather challenging hike over Fimmvörðuháls mountain pass over to Þórsmörk. You can book a return fare to Skogar either for one day or bring your tent and stay for more days. 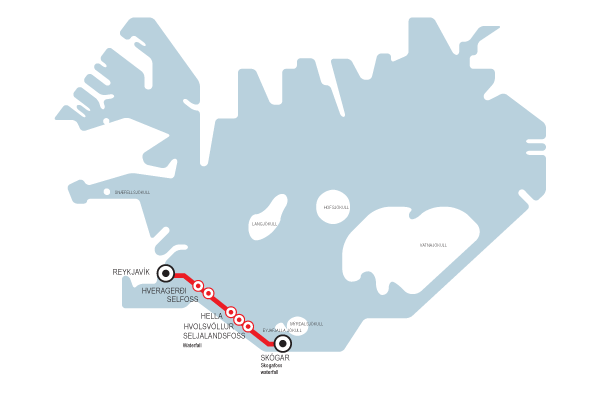 The South coast bus to Skógar bus departs daily from Reykjavik at the Harpa Concert Hall and from the Reykjavík Campsite. Please note this is a tourist bus with scenic stops at the most visited sites. All tours must be booked on-line in advance! Passengers to Glacier lagoon must change bus at Skogar. Additional price for bicycles: ISK 4,000.- Please note that we can not guarantee space on the bus for bicycles at all times.